Have you ever experienced a windsurfing vacation where the skill levels of all members of your family or group have been accommodated? If you haven't, come to Lac Bay Resort and The Windsurfer's Castle on the island of Bonaire in the turquoise waters of the Caribbean Sea. 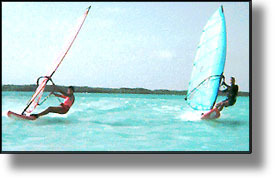 Lac Bay, the windsurfing site, is an 8 sq. km. lagoon that is protected from the sea by a barrier reef, creating ideal flat-water windsurfing conditions. But the enclosed, safe lagoon is not sheltered from the Caribbean trade winds, producing perfect side onshore wind that averages 15-25 knots from December to August and 10-20 knots from September to November. The majority of the lagoon is shallow (thigh-deep) so, during a fall, you have the energy conserving experience of touching a sandy bottom. 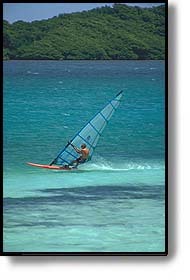 Windsurfing on the beach-side of Lac Bay is like snow skiing on a wide, safe, intermediate slope. It's ideal for beginner to intermediates, not to mention someone learning footstraps and carved jibes. The other side of Lac Bay is great for the more advanced sailor who wants to chop-hop and surf the 2-4 foot swells. Available for the very advanced are surf-sailing conditions at the inlet into the bay. And, if you're tired of the cold, the year-round air and water temperature is 82°F (28°C). In other words, to experience an active, happy, fun-filled vacation, come to Bonaire for The Conditions, The Castle, and Lac Bay Resort. Copyright (c) 1996-1997 Lac Bay Resort. All rights reserved.